Probably the most famous love story of Hotel Danieli is the one of George Sand and Alfred de Musset. 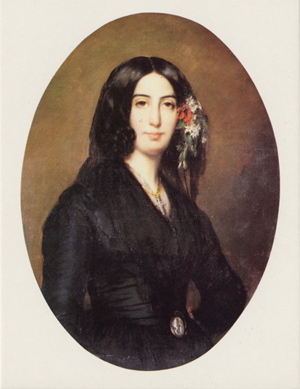 George Sand (real name Amantine Lucile Dupin) was a famous French writer with a reputation for wearing men’s clothes in public and smoking tobacco, behaviours not befitted for an upper class woman of the early 19th Ct.
Having left her husband, Baron Dudevant, she moved to Paris with her two children. 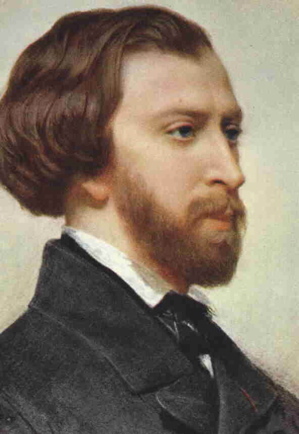 There she met De Musset, the aristocrat, novelist and poet. The two became lovers and decided to travel through Italy. As they couldn’t decide whether to go to Rome or Venice, they flipped a coin. As Sand herself wrote in The Story of My Life, it showed heads 10 times for Venice. It was obvious, they were destined to go to Venice... and so it was. I guess they didn’t have to flip the coin as to which hotel to stay in… Hotel Danieli, the most elegant of the Venetian hotels, then known as Albergo Reale (Hotel Royal) was high on the list of every aristocratic traveler’s “Grand Tour” itinerary. After one month at the Danieli, this most refined of Venetian hotels, Alfred became very ill and a doctor was called for him. At that moment he probably had no idea how fatal that would be. Not for his health, but for his heart. Unfortunately, by the time Alfred had recovered, a sudden love affair had developed between the young, handsome doctor and George Sand. She moved in with the doctor, and later after having finally accepted it, Alfred returned to Paris alone. Later the new couple moved to Paris too, where their relationship ended and eventually the young doctor returned back to Venice. The second famous love story that took place behind the façades of Hotel Danieli, one of the most cosmopolitan Venetian hotels, is the one of Eleonora Duse and Gabriele D’Annunzio. 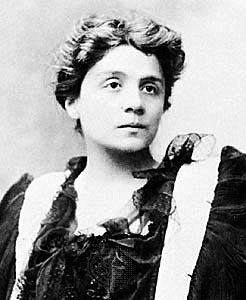 Eleonora Duse was a famous actress of the late 19th Century, famous for identifying with her roles to the point of them becoming detrimental to her health. In 1895, she was at the height of her fame but had divorced and suffered many disappointments in her love life. That same night they started their tumultuous relationship in one of the suites at Danieli, this most romantic of Venetian hotels. Interestingly enough, their love scene there was a repetition of the love scene from D’Annunzio’s “The Triumph of Death”, also set at the Danieli. They lived together for over 8 years in two villas in the hills near Florence. She was his muse that inspired many of his writings, but in 1904, after having been cheated on another time, Eleonora left D’Annunzio. 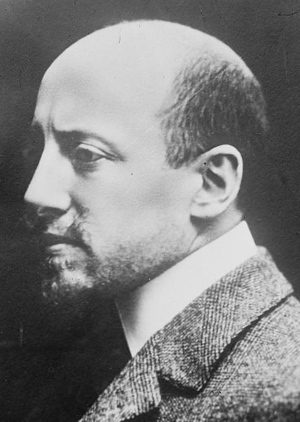 Regardless of their fallouts, Duse’s death caused a lot of grief to D’Annunzio. Although she had died in the US, he made sure he had her remains brought back to Italy from the US. When Eleonora’s daughter visited the elderly D’Annunzio ten years later, in one of the rooms she found a vase flanked by two photographs. One of his mother and another one of Eleonora Duse. Third, and the most recent famous love story connected to Hotel Danieli, one of the most historical Venetian hotels, is the one of the Greek shipping tycoon Aristotle Onassis and the beautiful soprano singer Maria Callas. Callas, or La Divina, as she was often called, loved Venice. That’s where she had her first big success in La Fenice in 1949 as Elvira in The Puritans. The party where she first met Onassis was organized for her by Elsa Maxwell, American gossip columnist and professional hostess renowned for her parties for royalty and high society figures of her day. Of all the Venetian hotels it only made sense Elsa’s party would take place at the Danielli. … all specially prepared according to original Italian recipes. At the time, both Onassis and Callas were married. So it wasn’t until 1959 that Onassis actually persuaded Callas to come join him on a cruise on his yacht Cristina. Although her husband at the time followed her on this 3 week long trip, somewhere between Monte Carlo, Portofino, Istanbul, Smirne and Venice... Callas fell head over heels for Onassis. Onassis asked for Maria’s hand in marriage from her husband, and so started their notorious affair. Whether you get dropped off in Venice with your cruise ship’s organized water bus transfer, you walk from the Marittima cruise terminal or take a vaporetto, don’t forget to take a peek into Danieli, the most legendary of the Venetian hotels! PLANNING YOUR FUTURE MEDITERRANEAN CRUISE?